Whether because of a lack of resources (human or material), a lack of know-how, or, simply, a lack of products adapted to meet their specific needs, a significant number of SMBs today still have relatively limited access to e-business operations. With the solutions provided by ACCEO, however, an SMB’s e-business ecosystem can be just as sophisticated and powerful as that of any large company. 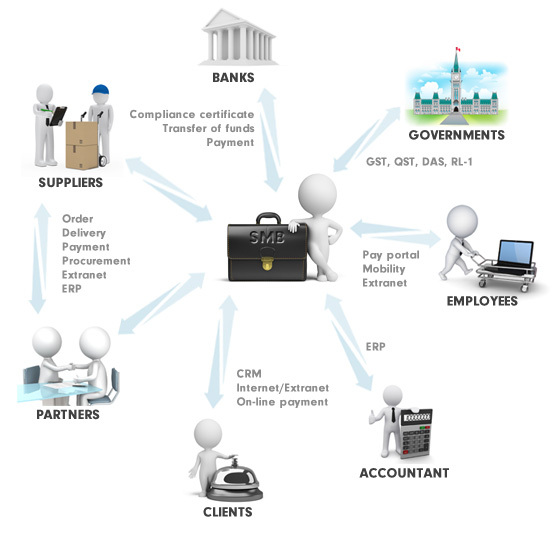 To exchange information or perform any number of transactions, an SMB’s management systems can now communicate directly with the systems of its suppliers, partners, banks, clients, employees, and accountants, and even with government systems.